Prime Minister Stephen Harper's former chief of staff, Nigel Wright, is being investigated for bribery, fraud and breach of trust along with Senator Mike Duffy, in an RCMP probe that has expanded to include the Prime Minister's Office, court documents released today show. RCMP Cpl. Greg Horton says in the court documents that there are reasonable grounds to believe Wright offered money or favour to Duffy contrary to the Criminal Code. Horton alleges Duffy agreed to accept the offer of money. Horton also alleges Wright and Duffy "have committed bribery, frauds on the government, and breach of trust." The documents include email excerpts that suggest numerous senior officials in the Prime Minister's Office were involved in the negotiations, as well as in writing the report by the Senate committee that handled the audit process. They also allege that Duffy himself was the instigator behind what he described in the Senate last month as a "monstrous fraud." "The evidence I have seen shows that the demands made by Senator Duffy in February (2013) were the start of the 'monstrous fraud'," Horton wrote in his affidavit. None of the allegations have been tested in court. No charges have been laid. In an email to CBC News Wednesday, Duffy declined to comment. Carolyn Stewart Olsen, Harper's former director of communications. Marjory LeBreton, then the government leader in the Senate. ​David Tkachuk, then chair of the Senate's internal economy committee. The production order also requires Duffy's bank to turn over some records. Emails from the Prime Minister's Office, reviewed by Horton, also suggest Stephen Harper knew more than he has so far allowed. "The PM knows, in broad terms only, that I personally assisted Duffy when I was getting him to agree to repay the expenses," Wright said in an email May 14, according to the Horton's affidavit. Wright was responding to an email by Carl Vallée, a press secretary for Harper. Vallée and Andrew MacDougall, Harper's director of communications, were looking for information after getting questions by a reporter about the issue. The story of Wright's cheque to Duffy broke that night, and Harper has said repeatedly he only learned about it the next day, May 15. But in a February email, Wright refers to Harper's "approval" related to earlier negotiations around covering Duffy's expenses. Emails on Feb. 21 and 22 suggest Duffy's lawyer, Janice Payne, and several PMO officials negotiated the agreement to repay Duffy's expenses and legal fees in return for the Senate committee dropping a third-party audit into Duffy's expenses, according to the RCMP document. In one email to PMO legal counsel Ben Perrin and other officials, Wright said, "I now have the go-ahead" on the repayment, "with a couple of stipulations." Wright continued that he needed to know "who, if anyone, Sen. Duffy ever intends to inform" about the repayment. Wright also wanted to "cap the legal fee reimbursement at $12,000" — the amount the party later confirmed it paid — and to know how much Duffy actually owed. "I do want to speak to the PM before everything is considered final," Wright wrote, according to Horton's affidavit. Less than an hour later, Horton said, "Nigel Wright followed up with an email stating 'We are good to go from the PM once Ben [Perrin] has his confirmation from Payne.'" Later in his affidavit, Horton says he has "seen no evidence that the prime minister was involved in having Senator Duffy's legal bills paid," but that Harper "may have been aware that the Conservative Fund would pay the cost of Senator Duffy's legal fees." Horton notes that the details of what Wright discussed with Harper are not contained in the emails, but goes on to say "I am not aware of any evidence that the prime minister was involved in the repayment or reimbursement of money to Senator Duffy or his lawyer." Court records show Duffy, along with three other senators, are being investigated by the RCMP for their housing or travel claims. The questionable expenses have been subject to enormous scrutiny and resulted in Duffy, Patrick Brazeau and Pamela Wallin being suspended from the Senate without pay earlier this month. In May, a news report revealed Wright had paid Duffy's expenses for him. Horton alleges in the court documents that the payment was part of an agreement that would have seen the government end a Senate audit into Duffy's spending, and confirm that he was eligible to sit as the senator from P.E.I., despite having lived in Ottawa for decades. Horton details alleged negotiations between Duffy's lawyer and Perrin, as well as Wright. Horton alleges Senator Irving Gerstein, who is in charge of the Conservative Party's finances, agreed to pay off what Duffy owed the Senate when he thought it was $32,000, but instead "agreed to reimbursement of the legal fees" when it was revealed Duffy had to repay more than $90,000. When the audit went ahead, "the PMO in turn set out to have the Senate report changed to reflect how they wanted it to appear," Horton alleges in the affidavit. The affidavit includes a detailed account of what Wright allegedly told RCMP investigators, offering insight into a man who has so far refused interviews. Horton writes in the affidavit that Wright was "incensed" at Duffy's $90,000 expenses tally, which included per diems paid for meals since his official appointment in 2009. Wright had thought Duffy owed $32,000 for accommodations alone, which Wright argued weren't appropriate since Duffy incurred no additional cost to live in the Ottawa home he'd owned for years. Senators and MPs are eligible for a housing allowance if their primary residence is 100 kilometres or more outside of the National Capital Region. "Mr. Wright was angered by the amount of money owed ... He was incensed that Senator Duffy was getting paid for meals that he ate in his own house in Ottawa," Horton wrote in the affidavit. Wright's lawyer, Peter Mantas, emailed a statement to CBC News on behalf of his client. "My intention was always to secure repayment of funds owed to taxpayers. I acted within the scope of my duties and remain confident that my actions were lawful. I have no further comment at this time," Wright said in the statement. The documents reveal for the first time that staff in the Prime Minister's Office were directly involved in arranging a Senate subcommittee report critical of Duffy to be altered so that it put him in a more favourable light. One staffer, Chris Montgomery, told police it was the first time in his seven years' experience that he'd seen staffers attend a Senate meeting and insist on the wording of a report. Montgomery, who was then director of parliamentary affairs for Lebreton, described an unusual May 8 meeting he attended with LeBreton, Stewart Olsen, and PMO staffers Patrick Rogers, Chris Woodcock and Sandy Melo. PMO staff, Montgomery allegedly told Horton, urged the senators to make the Duffy report less critical. He said LeBreton wanted the report to remain unchanged. In another police interview, Senate Clerk Gary O'Brien told the RCMP that Stewart Olsen moved an amendment to delete part of the Duffy report to make it less damning. Although Liberals objected, the amendment passed. Duffy and his lawyer were at the meeting. O'Brien, the administrative head of the Senate, said Stewart Olsen told him she wanted the audit of Duffy quashed. But O'Brien said he discussed her "partisan behaviour" with her, and he now believes she is on his side in a desire "to clean the place up." Jill Anne Joseph, the Senate staffer who prepared the reports on senators Duffy, Brazeau and then-Liberal Senator Mac ​Harb, based on the findings of the Deloitte audits, told the RCMP that so many deletions were made to Duffy's report she felt it was becoming "scant." "Senator Stewart Olsen seemed to have a separate agenda, rather than deal with the problem," Horton said Joseph told him. Tkachuk told reporters Wednesday that he spoke to the party's leadership about the Duffy audit report but insisted that was normal. Tkachuk said he didn't know about Wright's alleged deal with Duffy until May 15. "I never ever believed that Senator Duffy should be treated the same as the other two. He had paid his money back. Why would we have a report on him that was the same as the two people who we're trying to get the money from, who had already insisted that they weren't going to pay it back and they may take legal action against the Senate? You don't think all of that didn't factor into my equation of how this matter should be handled? Of course it did," he said. Mulcair: is it plausible PM didn't know? A spokesman for Harper distanced the office from the allegations contained in the RCMP court document. "The allegations are about an arrangement between Nigel Wright and Mike Duffy," Jason MacDonald said in an email to CBC News. "Because of their inappropriate actions, Mike Duffy has been suspended without pay as a Senator and Nigel Wright no longer works for the government. "We have responded fully and freely to every request for assistance, including any and all documents requested." 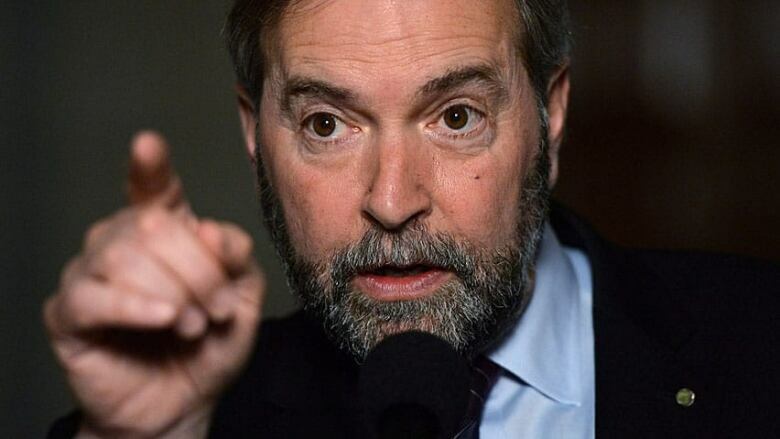 NDP Leader Tom Mulcair said the newly released court records show the government has "a lot to hide." "The question is, is it plausible that the prime minister didn't know?" Mulcair asked. "I find that less and less plausible." Liberal Leader Justin Trudeau said no Canadian believes they've heard the "full and real story" from the prime minister. "The prime minister needs to assume responsibility, not as leader of the Conservative Party, trying to protect his party, but as prime minister for all Canadians, to deal with them openly with integrity and tell the full truth," Trudeau said. Meanwhile, the chair of the Senate's internal economy committee, which handled the expense audits, said he is retiring from the upper chamber. Senator Gerald Comeau replaced former chair David Tkachuk, who resigned as chair of the committee for health reasons following questions over whether the committee softened the language in a report on Duffy's expenses. The committee is the one that referred Duffy, Brazeau, Wallin and Harb for audits by Deloitte. The committee then wrote a report on Deloitte's findings.